Munich - Dangerous going forward, somewhat vulnerable at the back. The balance wasn’t quite right in FC Bayern Munich’s first Bundesliga match under Pep Guardiola, despite the 3-1 scoreline. A defence that seemed impenetrable for most of last season was suddenly a cause for concern against Borussia Mönchengladbach. “A new manager’s first game with his new club is never easy,” Pep admitted after the match. Everything was going to plan in the first half. Bayern were moving the ball with speed and accuracy, barely allowing Gladbach a touch, as the Allianz Arena was treated to a touch of tiki-taka. The attacking 4-1-4-1 formation appeared to be working with Bayern boasting 26 attempts at goal - eight more than Jupp Heynckes's side averaged during the 2012/13 campaign. Schweinsteiger lacking fitness or partner? However, the flip side of Guardiola’s attacking philosophy reared its ugly head in the second half. The record titleholders became disjointed as gaps began to appear between defence and midfield, allowing Gladbach eleven attempts at goal, three more than Bayern conceded on average during the previous campaign. Javi Martinez, often lined up alongside Bastian Schweinsteiger, was responsible for protecting the back four last term, as the holding midfielder was tasked with halting opposition attacks before they had begun. Though Schweinsteiger currently lacks the required sharpness to play the holding role on his own, Martinez spent 85 minutes of Friday’s curtain raiser on the bench. In 73 minutes against Gladbach, Schweinsteiger, who was making his 300th Bundesliga apperance, was in possession 66 times - half as often as Franck Ribery was during the full 90. 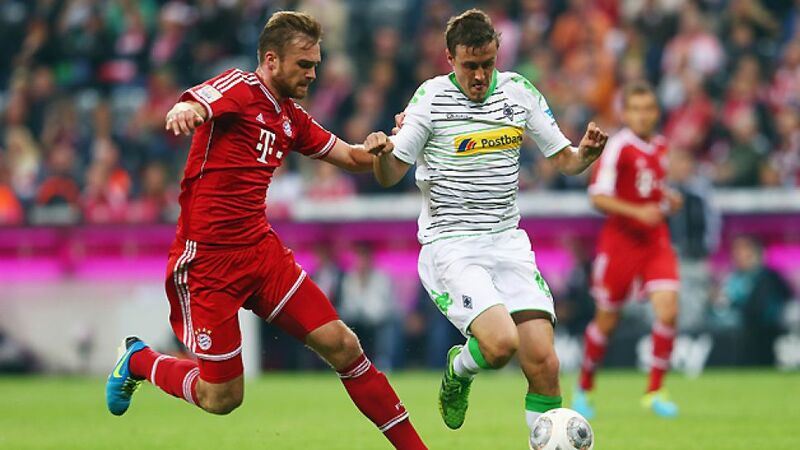 Bayern's vice-captain won only half his attempted tackles and didn't have a single shot on goal, while Gladbach’s Max Kruse and Raffael found space easy to come by as they attempted to release Patrick Herrmann and Juan Arango out wide. With gaping holes appearing in midfield and down both flanks, Bayern's defence was caught out on numerous occasions. Guardiola in turn, became increasingly irritated on the touchline, gesticulating wildly and calling several players over for animated discussions. So what conclusions has he drawn from his first league match as Bayern boss? “He won’t lead his players into a trap,” says president Uli Hoeneß. The coach himself doesn’t regard his side's system as a major issue: “I like the system, but perhaps I need to adapt more to my players and make some changes,” he said. “I wouldn’t have a problem with that.” One thing is clear though, Bayern are yet to master a style that had become second nature at Barcelona.